Just a stone's throw from Jacobsen Salt Co.'s new home, beautiful Netarts Spit acts as a kind of filter to help Jacobsen harvest water that is high in salinity and low in turbidity. After a boiling stage, the sea water cools in large evaporative pans. Jacobsen checks on the salt in the drying room. The final product is a delicate flake with the appearance of shaved ice. 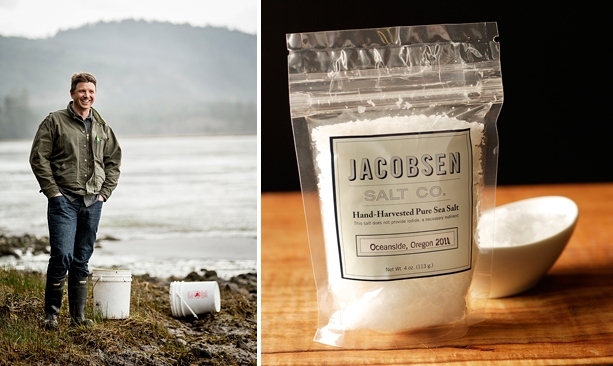 Chefs from around Oregon as well as New York, San Francisco and Seattle love Jacobsen Salt for its clean, briny taste. Oyster shells crunch underfoot on the shoreline of Netarts Bay, and a screen of clouds filters the late morning sun as a light wind riffles the waters between the beach and the long, sandy finger of Netarts Spit. To the north, clouds build up around the rocky formations of Three Arch Rocks National Wildlife Refuge rising out of the sea. 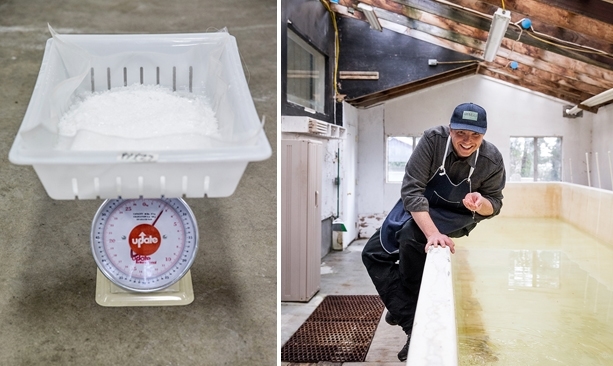 The location couldn’t be more Oregonian, so it’s fitting that it’s the new home of Jacobsen Salt Co., creator of artisan flake finishing salt — the latest accent on Oregon’s handcrafted culinary scene. Ben Jacobsen, a tall, affable 37-year-old, founded the company in 2011 and moved to the Netarts location, a former oyster farm, in December 2012. Sitting in his office on a typically drizzly spring morning and wearing a blue ball cap, sneakers and cargo pants, Jacobsen explains the company’s beginning, which almost sounds accidental. The Northwest native had returned to Portland after business school in Scandinavia and noticed that the burgeoning food scene had a notable absence — good salt. 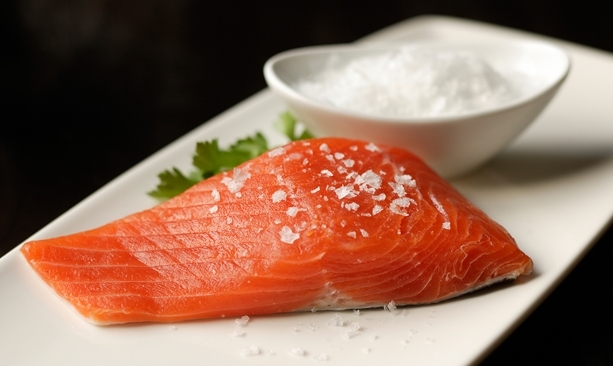 “Oregon had become leader in food culture and economy. But the one thing that transcends the whole experience is salt, and that wasn’t here,” he says. At the time, Jacobsen was between jobs and had been making finishing salt as a hobby, in much the same way brewers start at home. His girlfriend encouraged him to attend a product fair at New Seasons Market. When he offered them a taste of his salt on a freshly plucked tomato still warm from the garden, “they said, ‘We love it and we want a case for every store. 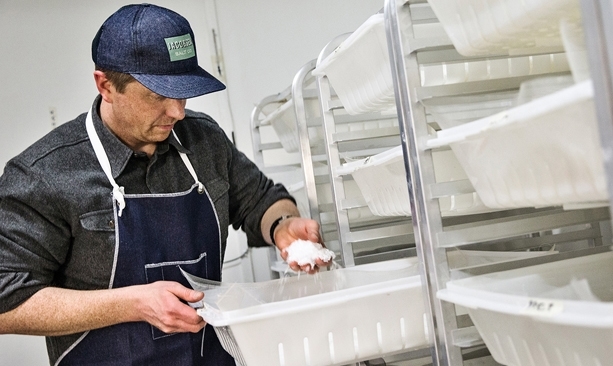 How soon can you get it to us?’” Since then, Jacobsen has moved quickly from making salt at home to hauling water over the Coast Range to KitchenCru, Portland’s co-op commercial kitchen and culinary incubator, to now establishing this 4,000-square-foot facility in Netarts. Good salt starts with good water. The Netarts location offers clean, well-filtered seawater that’s high in salinity and low in turbidity. The next determinant is “the process we take to coax great flavor out of the salt,” he says. In the Netarts kitchen, large pots boil away on a stovetop under a large stainless steel hood, throwing steam into the air. The boiling process reduces water volume and removes calcium and magnesium, which taste bitter. The water is then moved to evaporative pans, at which point large flakes sink to the bottom. They are harvested by hand and transferred to a drying room, saunalike on this chilly day. I ask Jacobsen for the exact temperature, but the specifics are proprietary. “Very warm and very dry,” he says with a grin. The result is a delicate flake with the appearance of shaved ice and a clean briny taste. 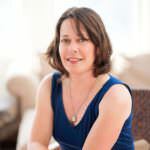 Jacobsen has received high praise from national food writers in publications like The Wall Street Journal, The New York Times and The Huffington Post. He’s also won the hearts of chefs at some of Portland’s best restaurants, including St. Jack, Paley’s Place, Ned Ludd and Clarklewis. “It yields to the fingertips and tongue very easily. Chefs like it because it is very easy to control the application,” he says. Jacobsen’s salt has led to some delightful Oregonian collaborations — like the Xocolatl chocolate bar he makes with Portland chocolatier Xocolatl de Davíd, ice creams at Salt & Straw and salt infused with wine from Grochau Cellars — an amber pinot blanc salt and a rosy pinot noir version. You can buy Jacobsen Salt at retailers like New Seasons Market, Zupan’s Markets and Made in Oregon. 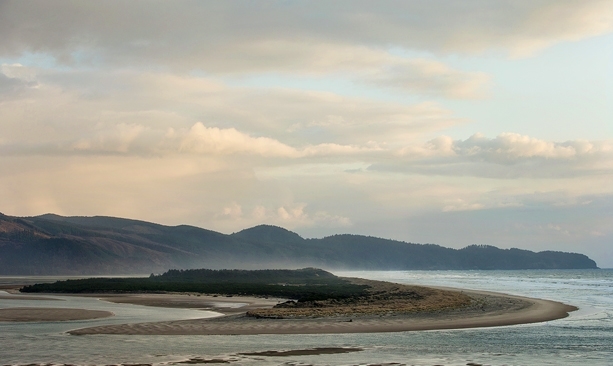 Extend your stay: Spend some time exploring the North Coast. Book at room at the Inn at Cape Kiwanda or The Cottages at Cape Kiwanda.